Has chilled the bleeding wounds upon Thy feet. How He persists to knock and wait for thee ! " Hunt grew up in Cheapside, London, England, and attended Royal Academy Schools where he studied to become a painter. His early spiritual leanings encouraged the belief that artists should return to the style of late medieval and early Renaissance painters, and that symbolic realism should be incorporated into modern art. With the help of metaphors, the viewer could read into a painting more than it apparently tells. Some viewers regarded this painting as symbolic of Christian salvation that came into a sinful world. Sin is represented here by an overabundant of neglected undergrowth. “The Light of the World” was begun in 1851 and placed on exhibition in 1853. It became so popular that Hunt was asked to paint a larger copy, which he did in 1900-04. English artist William Holman Hunt (1827-1910). The stained glass window features a kingly figure, white robed, bejeweled and crowned with thorns, knocking on a door at evening time. 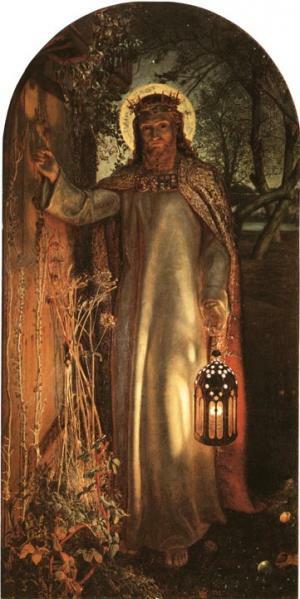 The bright light that illuminates his robe seems to have its source in the lantern at his side. Undergrowth on the left side and the trees above his head provide a dark background. Many church members were startled with the rich colors that appeared when the window was cleaned and reinstalled in 1986-87. A century of grime from wall lamps and candles had left a solid black background. Examine the panel below the figure. Note the rectangular outline of chipped, marble-sized pieces of colored glass. Note also the pale and streaked colors in the adjacent, brick-sized panels of glass. The window is unsigned but verified as a Tiffany creation by church records. Aaron Hopkins had served as the principal of Newton Academy in Shoreham, Vermont, a 200 year-old college preparatory school near Lake Champlain whose main building still stands. Mr. Hopkins came to Potsdam and built a tannery on the corner of Maple and Market streets and a sandstone home (now a sorority house) at the junction of Main and Union streets. He served as Potsdam Town Supervisor and Trinity Church Vestryman. Betsy, his wife, was the daughter of Samuel Eastman, a founder of nearby Hopkinton, NY. The couple was married in 1827 and had five daughters and one son.